I could not have picked a worse summer to train for a marathon than the summer of 2012 in central New York. It was the warmest summer on record, with 26 days of temperatures over 90F/32C and the second highest temperature ever recorded in the region (101F/38C on July 17). Even running late in the evening or first thing in the morning on weekends offered little relief. I was running in the soup. Despite posting some awfully slow times in training, I continued on to the next milestone: the Turning Stone 1/2 Marathon in mid August. The race itself was relatively uneventful, especially as now I was becoming pretty comfortable at that distance. I was able to lay back a little and enjoy the pretty vistas of the Madison County hills and fields around the Casino. For a while, I ran with a woman who was running the distance for the first time, and it felt funny as she asked for training advice considering it had been less than a year since I was in her position. We eventually parted ways around mile 10, just before the course offered up a nasty little surprise: a 1/2-mile hill on Beacon Light Road. With the temperatures starting to rise, the hill really knocked the stuffing out of me, and even though I managed to run it aggressively and finish the race strongly, I missed my PR by about a minute and my goal finishing time of 2 hours by 12. But I wasn’t too upset by either: my eyes were still firmly on the bigger prize across the border. September was a blur: work, home, run, eat, bed, repeat. I managed a whopping 167 miles that month, including back-to-back 20-mile runs around the village. Somewhere on the second of those runs, on a glorious Saturday morning with the mist hanging on the corn fields and the sun peaking up over the trees, I came to realize that following the program was not an inconvenience any more. Rather than dreading the workouts, or running them reluctantly, I was now looking forward to planning and executing them. It was then that I realized that the road was not going to end in Toronto–that there would be more marathons and greater athletic challenges in my future. Then, as now, I am reluctant to call myself a runner, but there was no doubt in my mind that a profound change had come over me. This was not something I had to do. This was something I wanted to do. All too quickly, September turned into October; like most traditional programs, the last 2 weeks tapered pretty extensively, and I was left both itching for race day and dreading it simultaneously. And then, just like that, it was race day. All of a sudden, everything got very real. 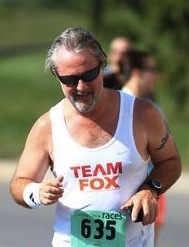 This entry was posted in The Flat-Footed Fox and tagged running, Toronto Waterfront Marathon, Turning Stone 1/2 Marathon. Bookmark the permalink.